The objective of Center for Research in Cancerology and Immunology Nantes-Angers (CRCINA), in partnership with the clinical teams of the University Hospitals (CHUs) of Nantes and Angers and the Institut du Cancer Ouest (ICO) of St Herblain (Cancer Center René Gauducheau) and Angers (Cancer Center Paul Papin), is to create a center of excellence that connects basic research, translational research and clinical practice in oncology, so as to ensure a continuum between the laboratory and the patient’s bed. 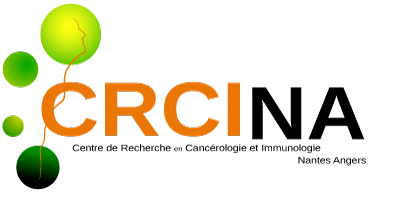 The Regional Center for Research in Cancerology and Immunology Nantes/Angers (CRCINA, UMR 1232 INSERM- CNRS ERL 6001) brings together 406 people (314 FTE) in 17 research teams, who develop multidisciplinary programs combining basic and clinical research in oncology. The teams are located in 3 sites: 12 in Nantes, 1 in St Herblain (ICO Gauducheau site), and 4 in Angers (ICO Paul-Papin sites and Angers Faculty of Medicine). “Immunology and Immunotherapy” regroups 8 teams which study antitumor and antiviral human cellular immunity, and from a more applied angle, the implementation of protocols of passive or active immunotherapy for which immunological monitoring is provided by CRCINA teams. “Oncogenesis and Targeted Therapies” consists of 5 teams who study the mechanisms of tumor progression and chemo and tumor resistance, in order to identify new markers of toxicity and response to radio and chemotherapeutic treatments and to develop new therapeutic approaches that specifically target cell death pathways. “Immunospecific targeting of radionucleides and radiobiology” comprises 4 teams who working on the immuno-linkage of radionucleides for in vivo tumor imaging and anti-tumor therapy, and on the effects of ionizing radiation on healthy and tumoral tissues. The work carried out by CRCINA teams results in an average of about one hundred publications per year in international peer-reviewed journals, numerous patents, the creation of several biotechnology companies and the implementation of several Phase I and II clinical trials originating directly from the work carried out in each of the departments.. The two main limitations contributing to the failure of conventional therapy of certain solid tumors, among which glioblastoma is a typical example, are: i) treatment resistance ascribed to cell adaptation to environmental cues and ii) sub-optimal delivery of active principles. A major de facto objective of glioblastoma treatment is the exclusive eradication of tumor cells infiltrated in the central nervous system (CNS). For more than 12 years our team has developed innovative micro and nanovectorisation-based strategies focusing on loco-regional delivery of anti-cancer medications in the CNS with demonstrated significant therapeutic benefit in preclinical models. To further determine significance in humans and to better understand how these systems behave at the micro-nano-biological interface we now propose to focus on two main loco-regional approaches. The first approach focuses on the development of novel nanovectorized internal radiation therapy combined with in situ radiosensitization. The choice of radiopharmaceuticals combined with the mode of delivery and intra-tumoral containment or targeting will be specifically addressed. The approach takes into account our new original data focusing on the nanoparticular targeting of the microRNA machinery involved in radioresistance. Milestones of this approach include the automation of the radiopharmaceutical formulation methods as well as the evaluation of the dosimetry correlated with biological responses. The second approach focuses on implanting biointeractive “deposits” capable of interfering with tumor cell behavior (in terms of migration, differentiation and sensitivity to elimination signals) within the tumors or their resection cavities (perioperative surgery). This strategy is largely based on our expertise in the development of innovative formulations for releasing bioactive molecules (e.g. proteins). The aim of this project is to target cells to be eliminated and to modify their environment in order to attract and confine them in a controlled area for their destruction. We expect to overcome key technological barriers limiting tissue homing and cellular and subcellular targeting of biomimetic vectors. We propose novel strategies for the targeting and elimination of radioresistant cells. The proposed work aims at developing relevant and optimized minimally invasive micro-nanomedicine strategies for the treatment of gliomas, as well as other solid tumors, by employing original and novel fundamental and technological approaches.